This magical contemporary floral tapestry "Fragrance" by Simon Bull has an evocativeness that is so powerful that people seeing this tapestry feel they can sense the fragrance of this flower emerging from the scene. Simon Bull realised the effect that his works had on people during an exhibition in London when he realised that colors and imagery were affecting people emotionally and were being hit in their emotional center. The vibrant color and emotion is what brought him widespread international acclaim and produce the signature look that is a style all his own. His works are collected by royalty, presidents, celebrities, and museums as well as private collectors and is well loved and admired for the uniqueness of his works. Here we see a yellow flower with red and deep peach overtones which shows the intricacies of the petals so beautifully and evokes the lush, fragrant and even Oriental stirrings in us. 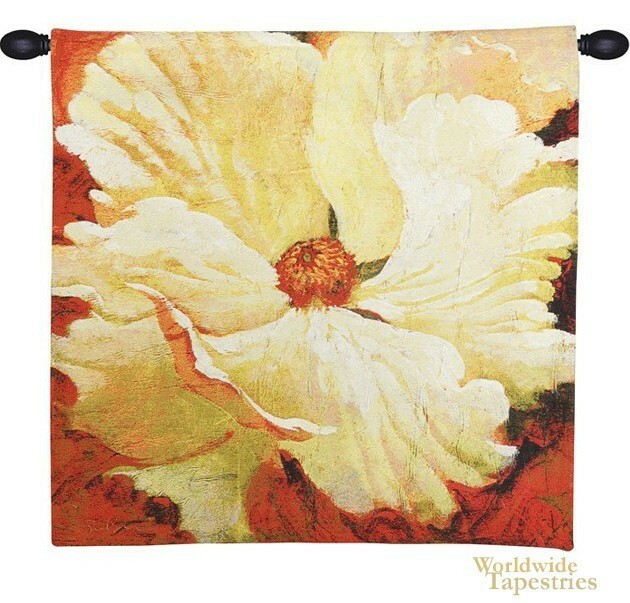 This contemporary floral tapestry is backed with lining and tunnel for easy hanging. Note: tapestry rod and tassels, where pictured, are purchased separately. Dimensions: W 21" x H 21"
Dimensions: W 37" x H 37"
Dimensions: W 56" x H 56"